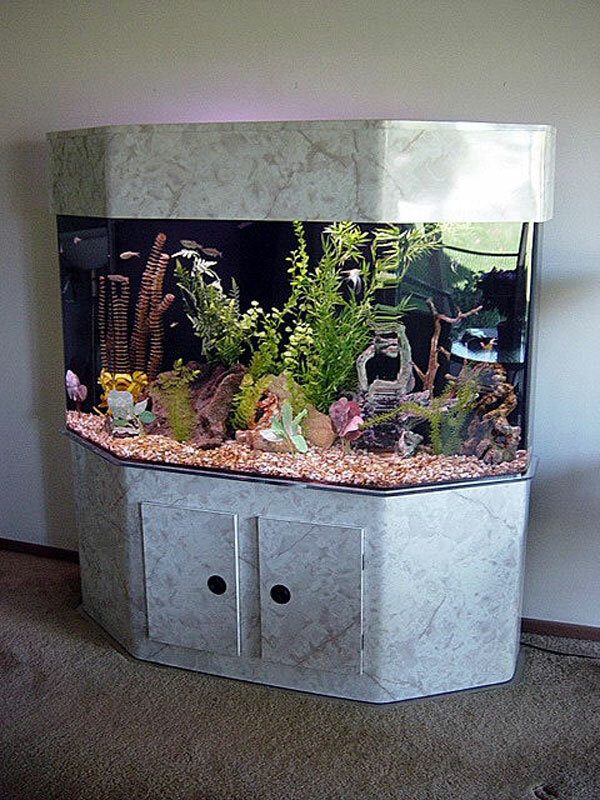 In addition to wood cabinetry, Midwest Custom Aquarium offers stands and canopies built entirely from acrylic. It offers a more modern or sleek look and with it you have a material that is impervious to water. All acrylic stands have at least a 3/8″ thick top and bottom which is beveled and polished and have lips that extend past the tank and stand bottom for beauty. 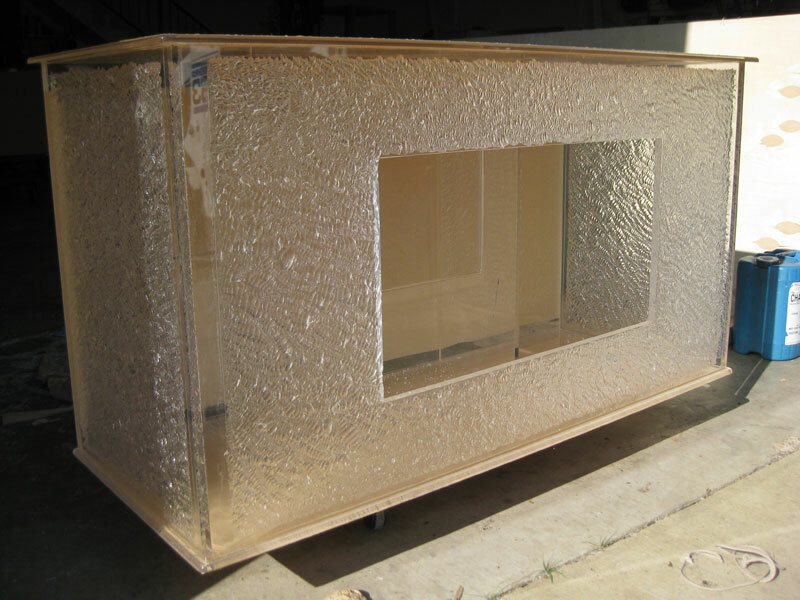 Acrylic canopies are lightweight and may be hinged via custom acrylic hinges, so that the whole canopy flips up and you have access to the entire top of the aquarium. 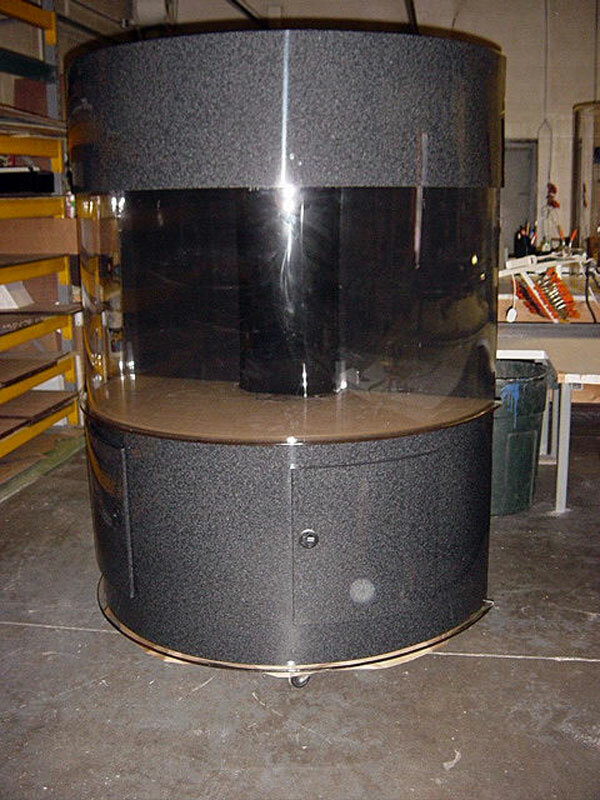 Standard acrylic cabinetry is gloss black, though we have built sets in a variety of other colors. Acrylic stands and canopies can also be laminated with plastic laminate to match any decor, there are literally hundreds of styles to choose from. Plastic laminate is extremely durable and is not affected by moisture. We use laminates from almost any manufacturer, including Formica, WilsonArt, and Nevamar. Most of the examples below are laminated in plastic laminate if they are not black. 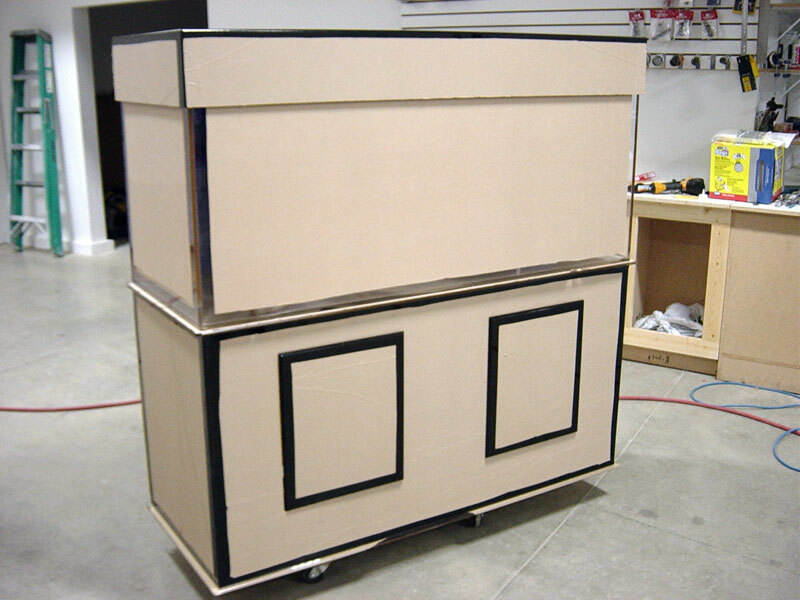 Acrylic cabinetry may also be laminated in real wood veneer of almost any species imaginable including oak, maple, black walnut, cherry, mahogany, birch, alder, pine, and many more. 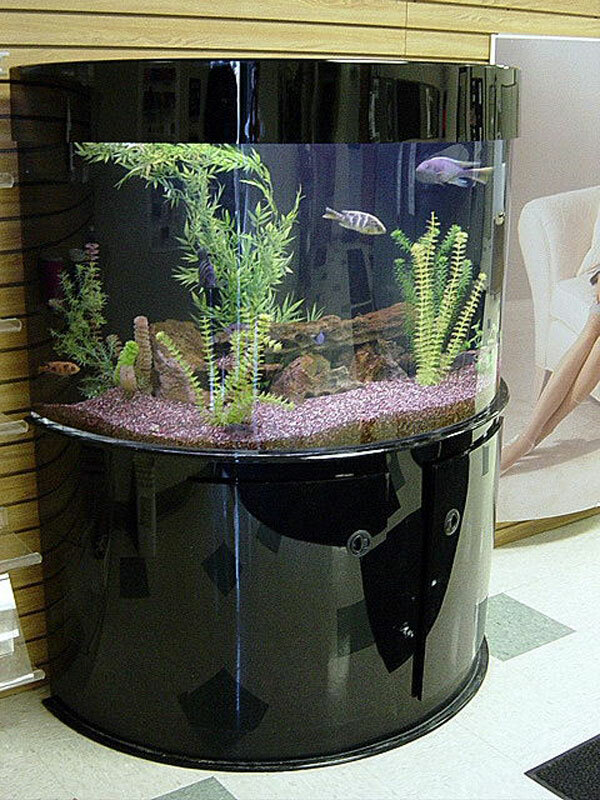 One of our specialties is the FilterStand, a practical option that takes any acrylic stand and builds the sump and filtration right into it. When you open up the doors, one or more of the interior sections in it will have 4″-8″ of water in it and will be your sump. 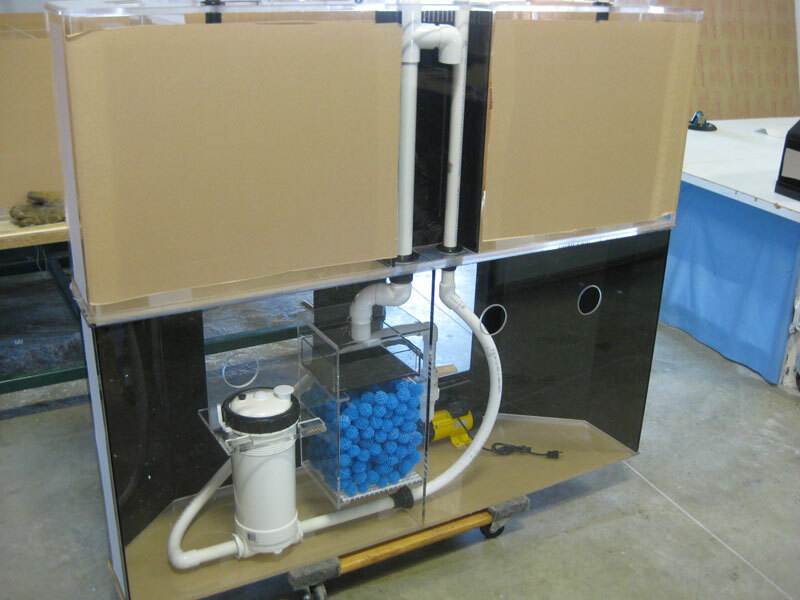 One of the wet sections will also have a trickle filter with bio-balls and a pre-filter drawer built into it also. 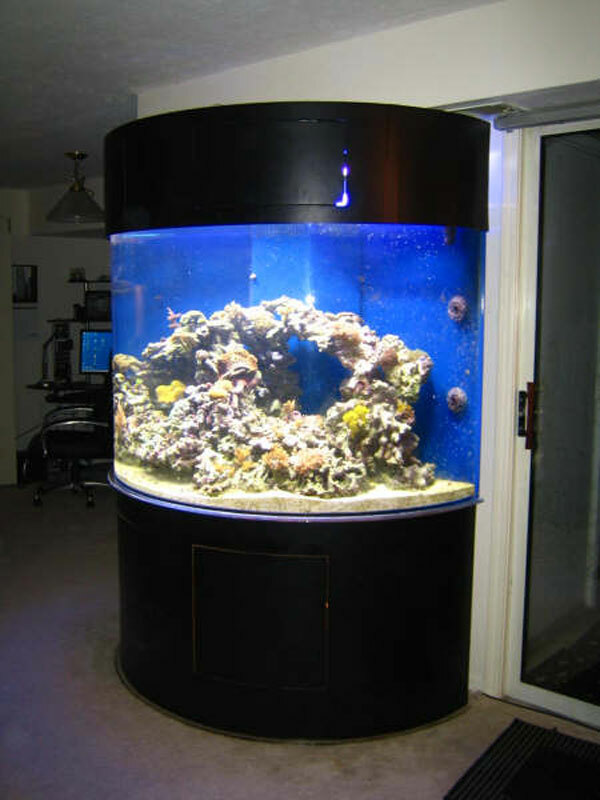 If a reef tank this is usually replaced by a refugium. Any other filtration that is dry goes into the adjacent dry section and is connected to the wet compartment via bulkheads. 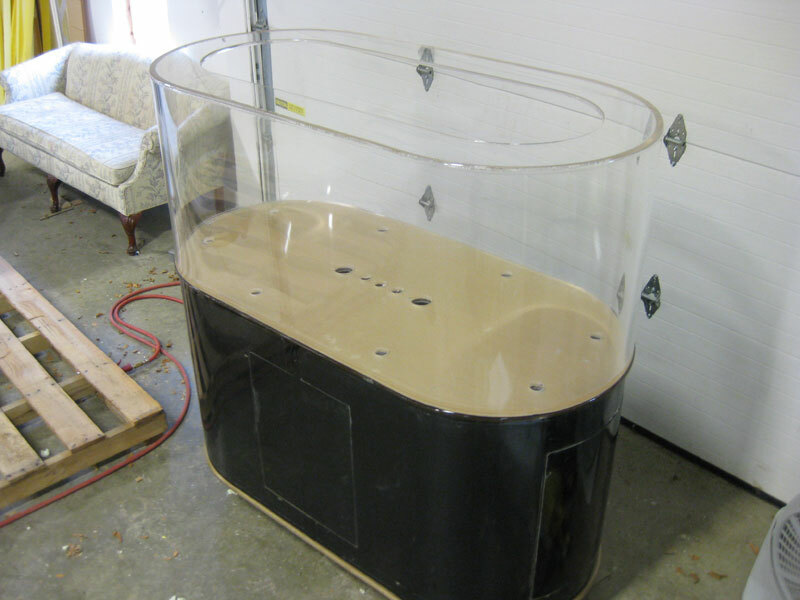 This saves you from having to purchase a sump or trickle filter. Because the bottom of the stand is actually the sump and has water in it, you do not have to worry about drips or spills. Access to all filtration is very easy through the stand doors. FilterStands have ventilation holes drilled in the back to allow moisture to escape and prevent salt creep on marine systems. 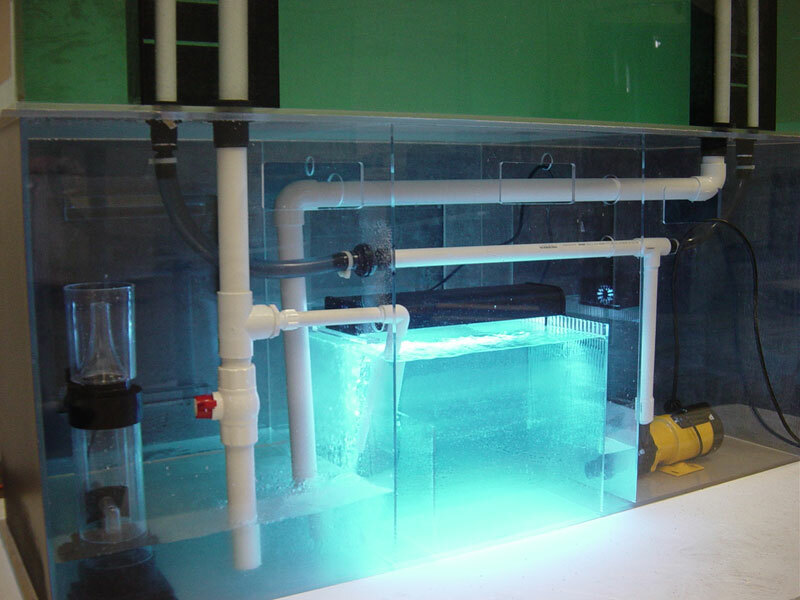 Protein skimmers and other components may simply be set inside one of the wet sections. 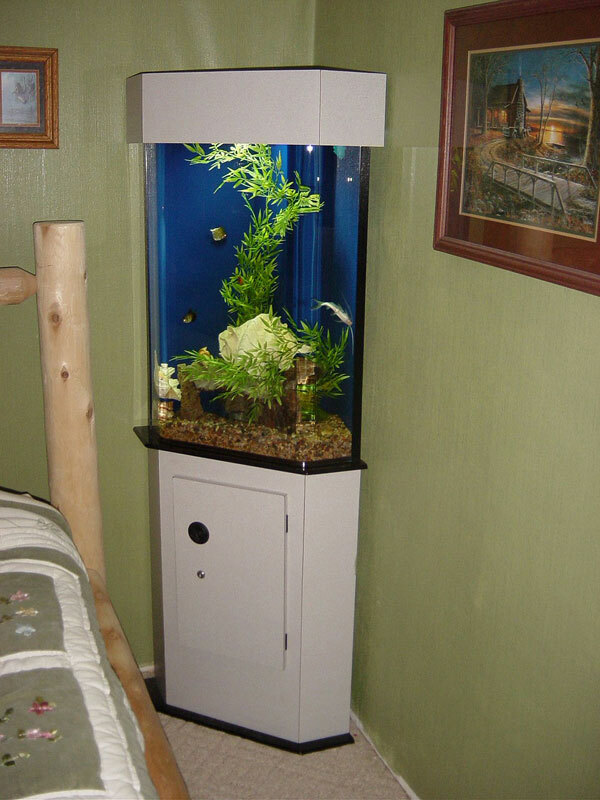 If it is a component that does not sit in the sump it can also be plumbed through a divider wall and connected to a wet section via bulkheads. 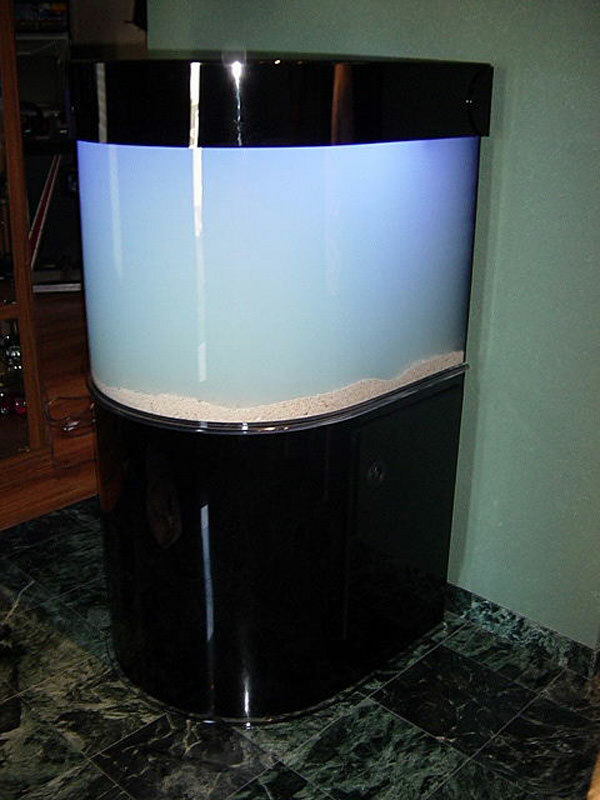 Filter Stands can be built for aquariums of all shapes. 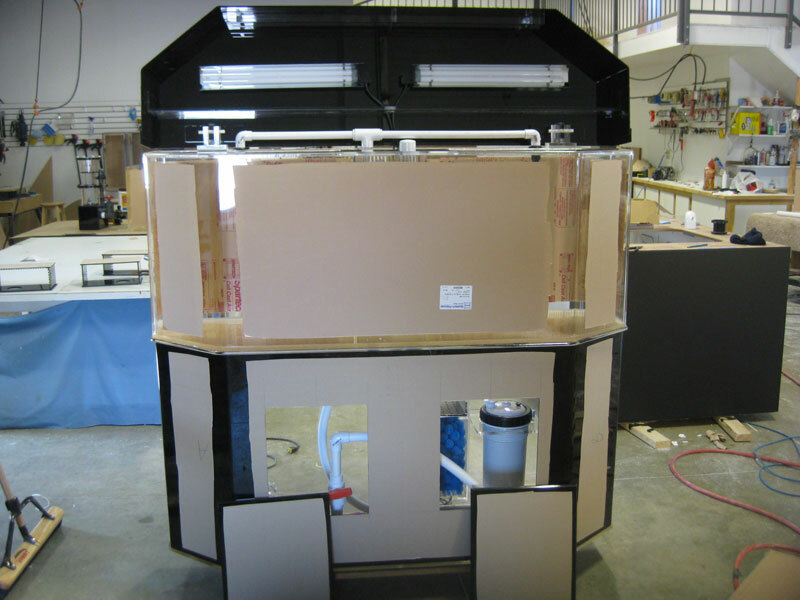 The basic concept for all Filter Stands is the same, but each ends up getting set up a little bit differently due to differing aquarium shapes and to accommodate the equipment being installed inside it. Almost all acrylic cabinetry is ordered with the FilterStand option. Some examples are shown below with a brief description. All will have FilterStand option built in. 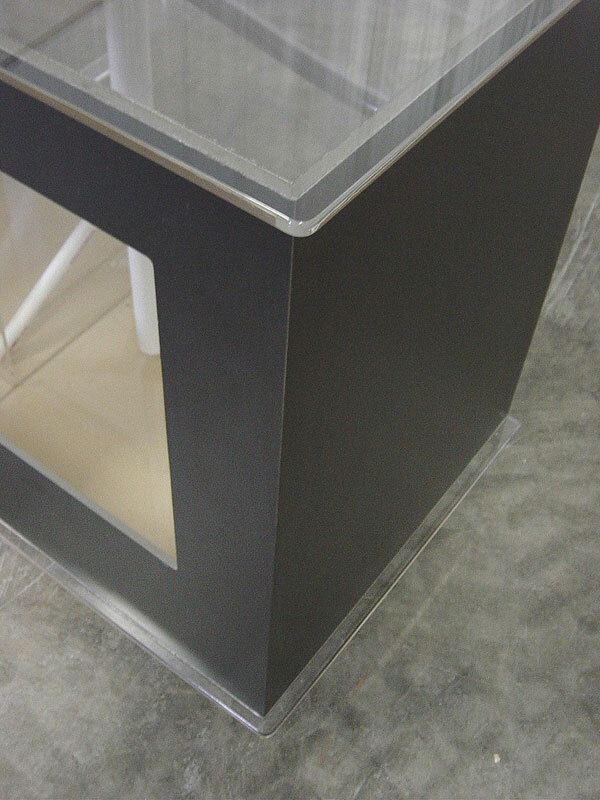 Corner pentagon with standard gloss black acrylic cabinetry. 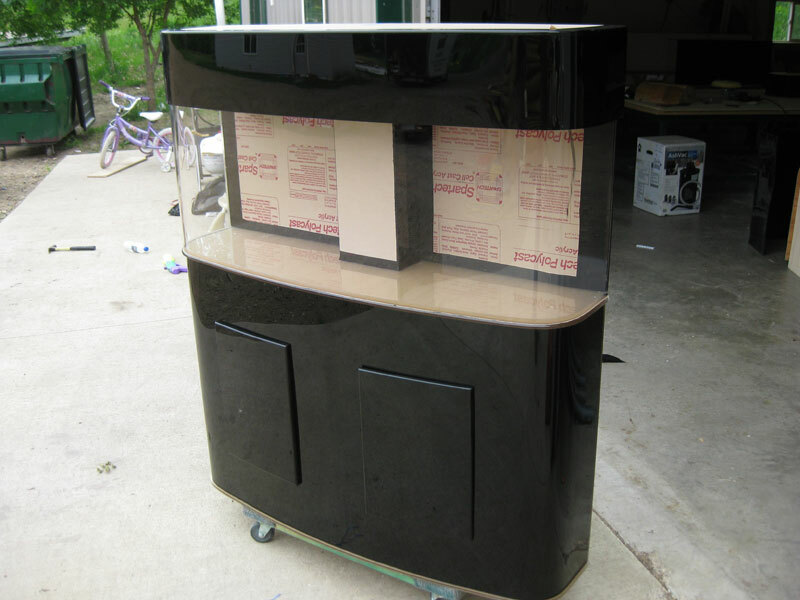 Half cylinder with standard gloss black acrylic cabinetry. Bowfront with standard gloss black acrylic cabinetry. Rectangle with standard gloss black acrylic cabinetry, closed. Tan color is removable protective paper still on. Rectangle with standard gloss black acrylic cabinetry, open. Tan color is removable protective paper still on. Detail of stand showing the lip that extends past the top and bottom on the stand. Front view of a flat back hexagon ready to go. Hinged canopy with retrofit lighting. 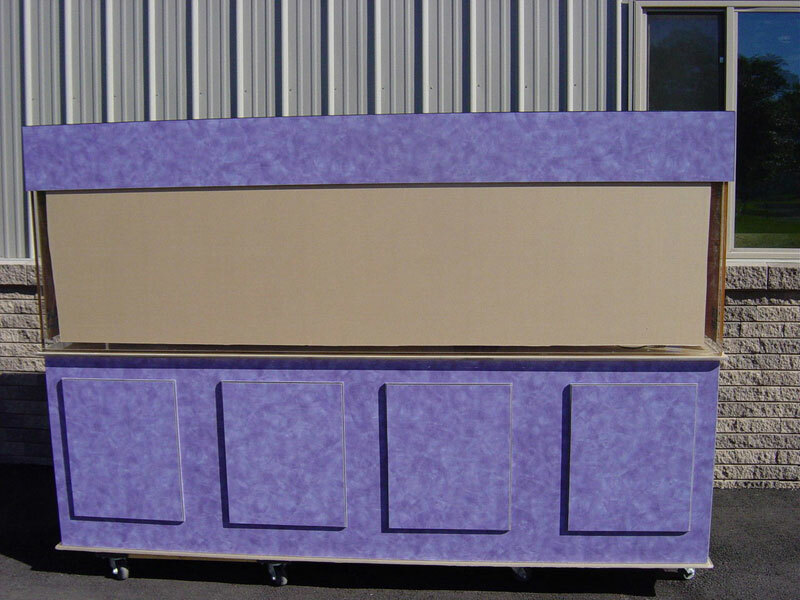 Rectangle with laminated acrylic cabinetry (we didn’t pick the color). 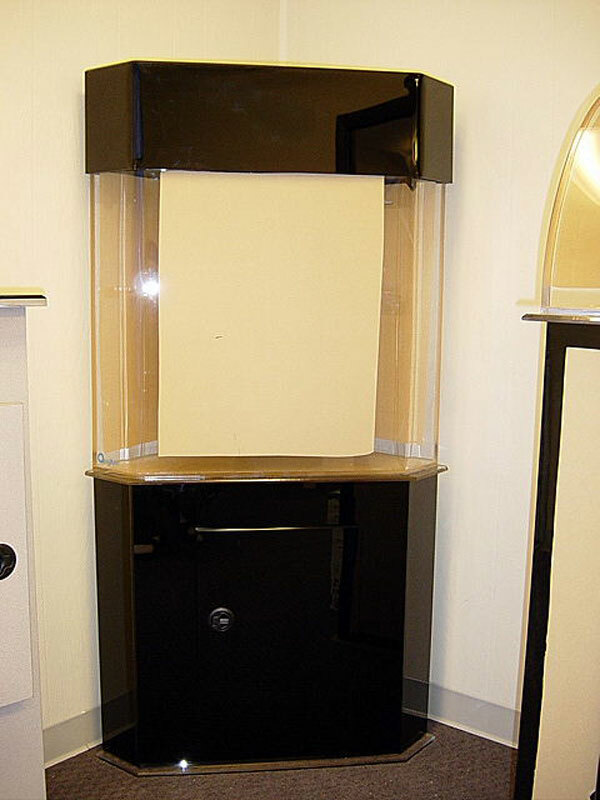 Small bullnose with standard gloss black acrylic cabinetry. Rear view of flat back hexagon showing built-in trickle filter and some plumbing. 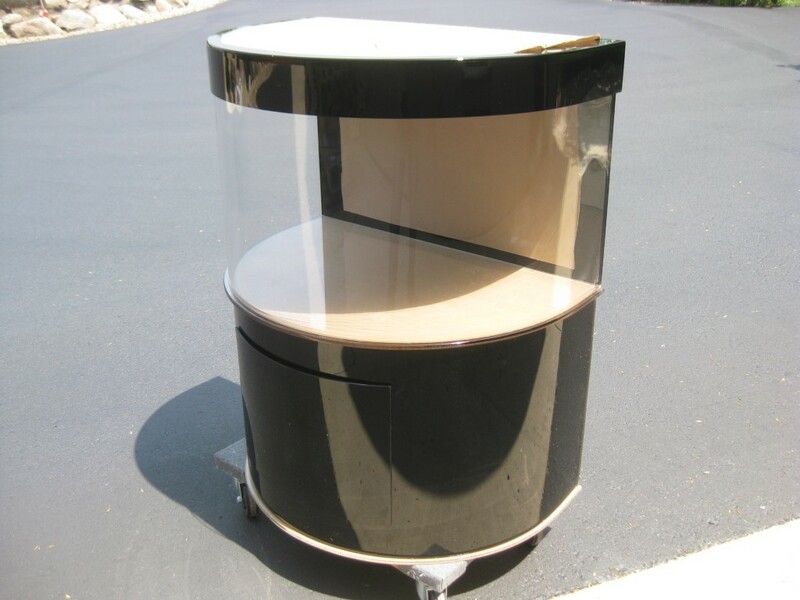 Larger half cylinder with laminated acrylic cabinetry. Black acrylic wrapped around steel frame. Held in place with Velcro so the whole works comes off for access. This example obviously would not have the filtration built in. You are looking at the back in this picture. Corner pentagon with laminated acrylic cabinetry. Flat back hexagon with laminated acrylic cabinetry. Half cylinder with laminated black acrylic cabinetry. 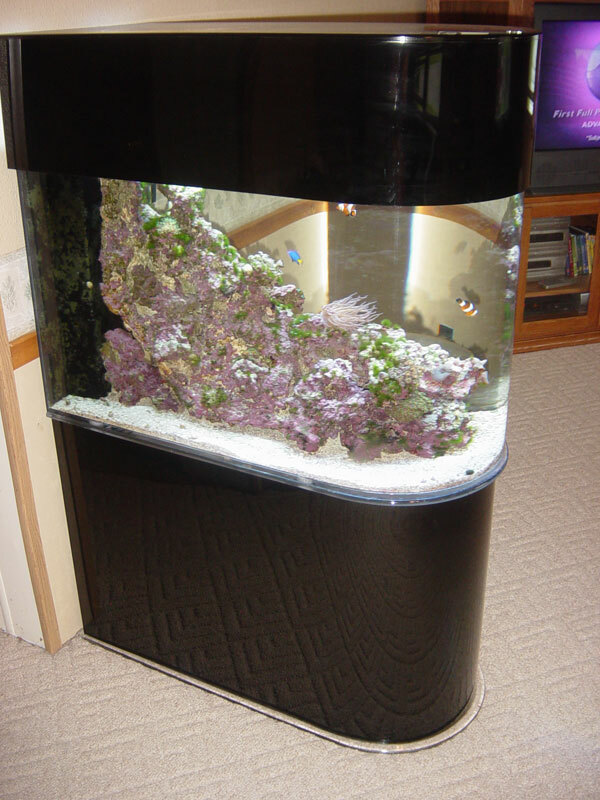 Bullnose aquarium (just filled) with standard gloss black acrylic cabinetry. Custom acrylic stand with chiseled acrylic to look like ice. 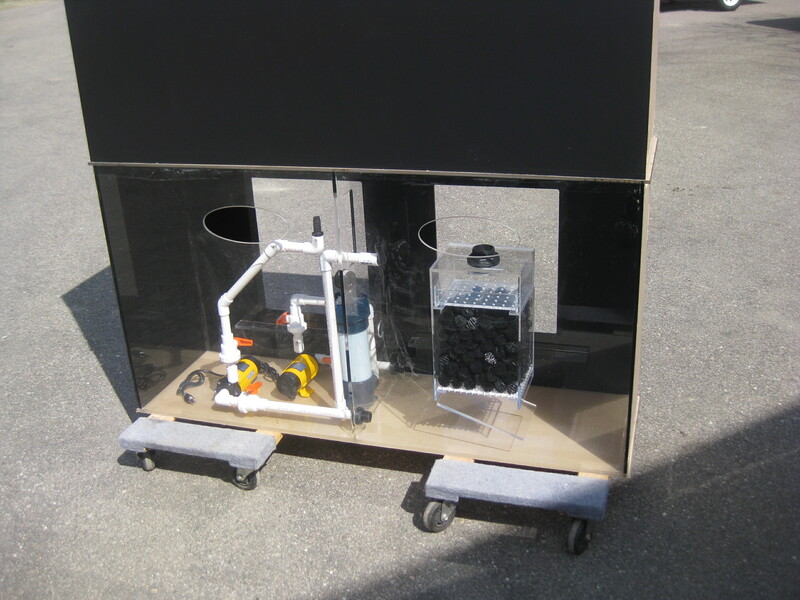 Rear view of acrylic Filterstand showing a simple freshwater filtration system. Right half is the sump. 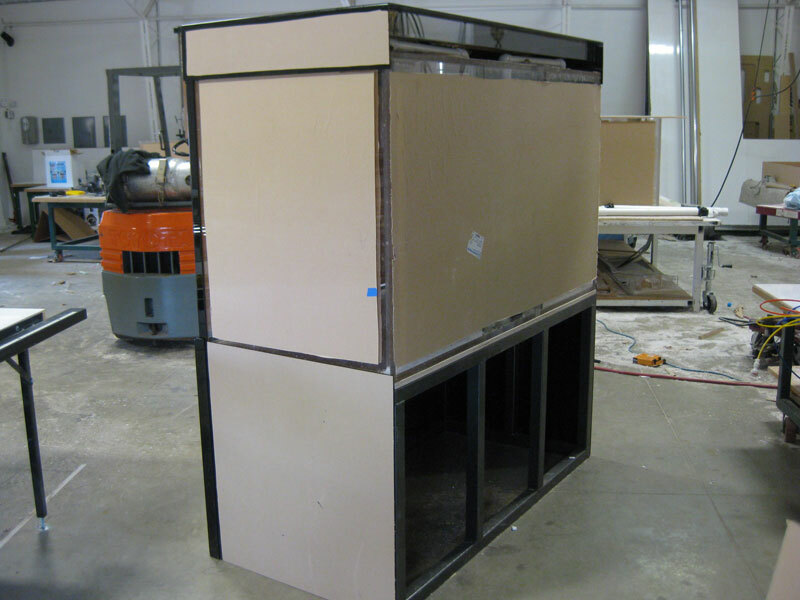 Double bullnose (racetrack) with laminated acrylic cabinetry, protective film still on. 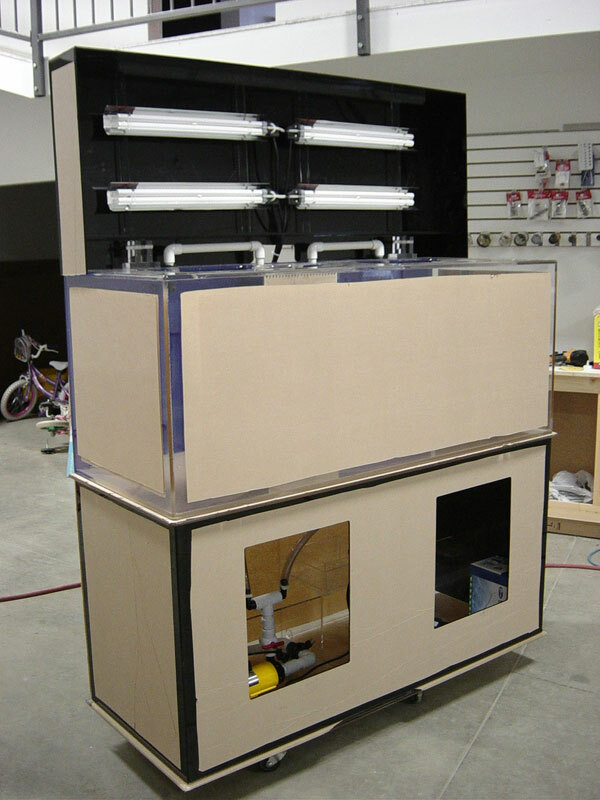 Rear view of a Filterstand for a reef aquarium while running, with refugium.